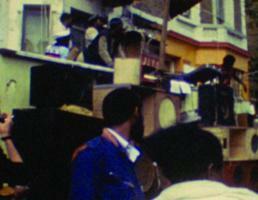 Territories is an experimental documentary about the Notting Hill Carnival. It locates the event within the struggle between white authority and black youth, in this case over the contested spaces of the carnival, and reflects on its history as symbolic act of resistance. The film makes the case using montage: cutting carnival scenes with archive news reports - police surveillance to rioting in the street - and crossing looks of desire with alienation, from police to reveller, woman to man, man to man. Add to this a disembodied, political critique and trenchant images of police violence and the audience soon becomes aware that the documentary itself is part of the resistance. In 25 minutes, Territories invites the viewer to question everything and to protect her self-identity by whatever means available. As an exposé of the way in which the power of carnival has been neutralised by mainstream documentaries this film has a rhetorical power. It is a joy to watch. The camera is everywhere, recording and remembering, the images are fluently edited and there is a profusion of visual ideas, some brilliant. Territories is an unusual, provocative early film from the Sankofa Film and Video collective.